June 22, 2011 – San Jose, California – Solar Thermal manufacturer and distributor Free Hot Water announces a solar water heating training partnership with Boots on the Roof, a national solar trainer based in Fremont, California. The partnership provides an opportunity for graduates of Boots on the Roof’s 6-day Solar Thermal training boot camps, to become Free Hot Water Certified Installers. Boots on the Roof’s 6-Day intensive program is ideal for contractors, plumbers, HVAC professionals, swimming pool contractors, and other building professionals with some plumbing experience. Participants will learn the fundamentals of design, installation, and sales of solar water heating systems. Boots on the Roof’s blended learning approach incorporates Instructor-led lectures, presentations, and hands-on labs. Graduates will also have learned the use of site-assessment tools in the design of solar thermal systems. 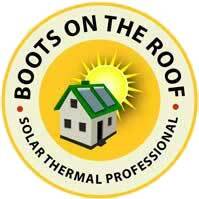 As a Certified Free Hot Water Installer, graduates of Boots on the Roof will be eligible to receive professional pricing on Free Hot Water’s online catalog of solar thermal products and free customer referrals. The online catalog includes over 1,200 solar thermal and plumbing products, including pre-engineered 0G-100 commercial systems and OG-300 residential systems. Boots on the Roof offers participants a subsidized lodging package that includes a hotel suite and free shuttle transportation from San Jose Airport. More information about Boots on the Roof’s Certified Training is available at Free Hot Water and Boots on the Roof web pages. Boots on the Roof is a Fremont, California based renewable-energy education facilitator. Their programs, which are 5 or 6-day boot camps, focus on solar thermal instruction, solar PV teaching, and wind energy training. Authorities in the renewable energy field teach all programs. Their goal is to train and certify green-collar workers in a wide range of settings for a renewable power profession. To find out a lot more about Boots on the Roof, check out their website at www.BootsontheRoof.com.